Our Bhutan treks and tours are organised wherever possible to coincide with one of the country's important religious festivals. These are colourful events with music and masked dancers and attract hundreds of people. Similar ancient ceremonies also used to take place in Lhasa in Tibet, but now only in the isolated Kingdom of the Thunder Dragon do such rites take place on such a lavish scale. 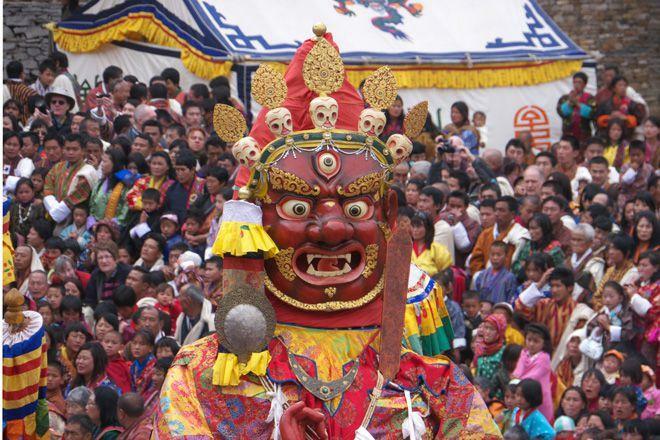 Mountain Kingdoms MD, Steve Berry, recalls his experience of one of the dances at a Tsechu (festival) in Thimphu, Bhutan. "The King of the Dead, even sitting crossed-legged, was fifteen feet tall. His demonic ministers sat below him like government and opposition facing each other, and not unlike our own unruly honourable members they barracked each other at intervals. They were Gods with the bodies of men and the heads of demons, only slightly more fearsome than our own Front Bench. The king's face was a mask of contorted anger and he glowered down into the stone flagged courtyard of the Tashishhodzong, in the main monastery/fortress in Thimphu, capital of the Kingdom of Bhutan, a tiny independent state in the eastern Himalaya. We were watching the Dance of the Judgement of the Dead, one of the many ancient rites, some dating back to the eleventh century, that are held at the Tsechu, or festival, in October, to dispel the bad spirits of the previous year. Long Tibetan horns boomed, drums rattled, cymbals clashed, all the ministers screamed and shouted and leapt into the air and the effigy of the king of the dead was carried round the fortress courtyard by a dozen red robed monks with the Bhutanese crowd cowering back in real fear. I'm sure everyone, including me, wondered what would happen when their judgement day came."